The search for a viable route to India was, since the mid-15th Century, the main goal of almost all expeditions made by the Portuguese Kingdom. In 1488 Bartolomeu Dias rounded the Cape of Good Hope and Pedro da Covilha found a land route, but it was only in 1498 that Vasco da Gama reached the goal and became the first European to reach, after some stops along the way, the legendary Calicut by sea. Vasco da Gama accomplished something exceptional, granting Portugal the possibility to achieve a monopoly on the spice trade between India and Europe. Vasco da Gama was charged with finding a maritime route to India. Players play the part of rich shipowners who, under his patronage, aim to achieve prestige and riches. To succeed in the enterprise, they must manage the money and actions at their disposal in order to hire captains, recruit crew, build Ships, launch them and send them to the Landings of Natal, Terra de Boa Gente, Mozambique, Malindi, Mombasa and Calicut. For each Ship sent, Players will receive an immediate reward and will gain prestige (Victory Points). The further the Ship is sent, the lower the compensation, but the higher the victory score that the Player will earn. Ships at Landings that are “complete” at the end of the Round (i.e. reached by a certain number of Ships) will earn further Victory Points for their owners and will then advance, under certain conditions, to the next Landing. This creates the opportunity to earn again Victory Points in the following Rounds. During each Round, Players take actions in various Areas (Navigation, Recruiting, Purchase Projects or Characters). Planning is fundamental: The right to take an action could be free of charge or paid for. The earlier a Player plans to take an action, the more likely that he will have to pay for it. Players will have to ask themselves if and how much they are ready to pay for the right to act first in a certain area. Vasco da Gama himself will decide which is the first free of charge action for each Round. He will also help some of the Players by making some money available to them. This great maritime enterprise raises the interest of 4 influential Characters. Aiming to have a substantial role in the development of the new commercial route, they will also provide their favors free of charge to the Players. Francisco Alvares (The Priest) will make available a number of Missionaries to be used as crew members, Girolamo Sernigi (The Merchant) will organize Ships built and manned, Bartolomeu Dias (The Leader) will grant an increased initiative and additional Victory Points; Manuel I (The King) will allow Players to take an additional action in the name of the Portuguese Kingdom. 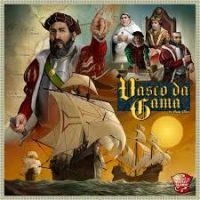 Add a Review for "Vasco da Gama"